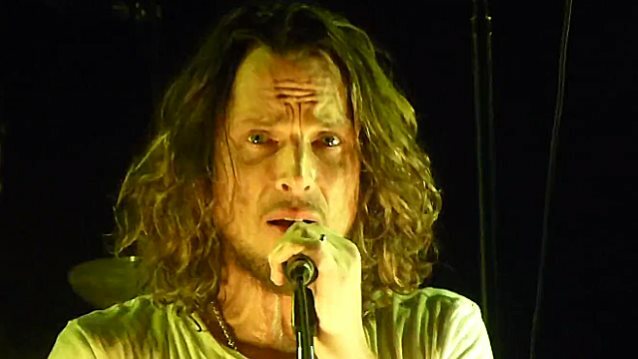 Members of METALLICA, PEARL JAM, LINKIN PARK, NIRVANA and JANE'S ADDICTION are among the friends and colleagues who paid their respects to SOUNDGARDEN singer Chris Cornell earlier today (Friday, May 26) as his ashes were laid in his final resting place. The private event on the Fairbanks Lawn at Hollywood Forever Cemetery included eulogies by RAGE AGAINST THE MACHINE's Tom Morello, PEARL JAM's Jeff Ament, LINKIN PARK's Chester Bennington and Brad Delson and SOUNDGARDEN's Kim Thayil and Matt Cameron. Bennington sang "Hallelujah" for mourners, which included Cornell's widow and two young children. A photo of Cornell final resting place — located next to that of his friend, Johnny Ramone — can be found at TMZ.com. More photos from the service are available on the Daily Mail web site. Cornell committed suicide on May 18 in a Detroit hotel room. The results of toxicology test are pending and will reveal what, if any, other substances besides his prescription medication Ativan were in his body at the time of his death. Cornell took Ativan for anxiety, with his family's lawyer suggesting last week that side effects of the drug have been linked to suicidal feelings. SOUNDGARDEN's longtime house engineer and tour manager, Ted Keedick, told TMZ that the vocalist seemed to be "high" and "fucked up" during the band's last performance in Detroit, hours before Cornell's death. He said that the singer was "out of character from note one of the show." Cornell's remains were cremated on Tuesday (May 23). After 3:00 p.m. local time on Friday, following the private ceremony, the public is welcome to visit the gravesite. The memorial service for the Soundgarden singer took place at Hollywood Forever Cemetery on Friday.